Allentown, NJ (June 8, 2010) – Cesar Parra and his Piaffe-Performance team debuted their horses in the northeast at the Eastern States Dressage and Combined Training Association’s Memorial Day CDI with great success. It was the team’s first show in New Jersey after returning from the winter season in Florida and collectively they spent much of the show in the winner’s circle. Cesar Parra dominated the small tour with Lori Washton’s KWPN gelding, Olympia. Parra and Olympia won the Prix St. Georges score of 71.789 and the Intermediaire I with a score of 71.000 percent. The seasoned pair has shown at this level just over a dozen times and has always been over 70%. 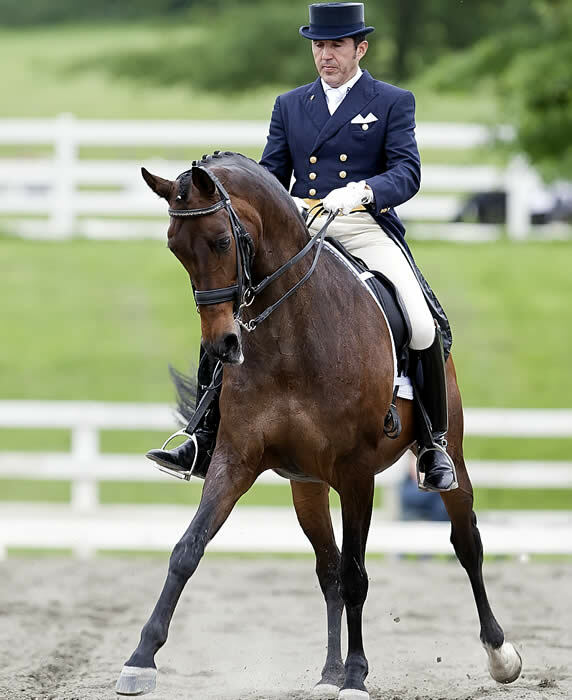 They are in top form as they head for the USEF/Collecting Gaits Farm Dressage Festival of Champions August 6-15 at the U.S. Equestrian Team headquarters in Gladstone, New Jersey. Parra also notes that Olympia’s consistent performances will be just what it takes to represent the US at next year’s Pan American Games. Parra also won the FEI Intermediaire II riding Michael Davis’ Grandioso with a score of 67.895%. “He (Grandioso) is coming along great and we are developing him at just the right pace. He is young and talented so there is no reason to rush him,” said Parra. And while he was very pleased with both of the horses he competed with, Parra was bubbling with pride over the successes his students collected over the weekend. Dominique Casavettis from Whitehouse Station, NJ and her horse Charming Princess took top honors winning both the junior rider team and individual tests. Casavettis is a student at Hunterdon Regional High School who started out as a working student with the Performance Farm team at the age of 13. Piaffe-Performance student Chase Hickok also achieved a personal best with second place wins in the both the CDI Young Rider team and individual tests on her new horse Palermo. Hickok, a student at Stanford University, is a collegiate equestrian switched to the Dressage less than a year ago after meeting Dr. Parra at a clinic in North Carolina. Adult amateur John McGinty, a veteran member of the Piaffe-Performance Farm team, equaled the accomplishments of the under 21 crowd by achieving a personal best for himself and his horse Iowa B and a tri-colored reserve championship ribbon! “Piaffe-Performance amateur riders Krista Schrager and Jeannie Santos also put in top performances in the Third level division that earned them honors,” said Parra. And finally, working student Kevin Kohnman won his in 4th Level Class on Wellington Farm’s Agastrofos with an impressive score of 73.256%, while teammate Nadine Buberl, who joined the Performance Farm Team after completing her Masters in Riding in Germany, rode another talented young horse owned by Wellington Farms, Wellington Sandro Star, to the win in Training level with a score of 80.870%. “It was an amazing weekend for all of us,” said Parra, “I am extremely proud of every horse and rider for their efforts. The Piaffe-Performance team came home with nine blue ribbons, a Championship and Reserve Championship ribbon and lots of smiles”. For more information on Parra or Piaffe-Performance, which has facilities in New Jersey and Florida, visit their website at www.piaffe-performance.com.